"Psychic Robots, Mysteries and Violence"
Battery and Coil are two psychic robots of varying competence living in a giant city contained entirely within a stone box. Nobody in Psychobox City knows why they're there, how long they've been there or what's outside. Battery and Coil intend to find out. Psychobox Robots has not been tagged yet. Help others find Psychobox Robots by tagging it! 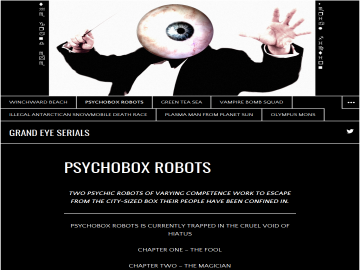 Psychobox Robots has not been reviewed yet. Psychobox Robots has not been recommended yet.